The human body is one of the most incredible machines ever, but its sensory input methods are somewhat limited. We have these five senses to tell us all about our world. What if we had a sixth sense – one that allowed us to draw on collective human knowledge? 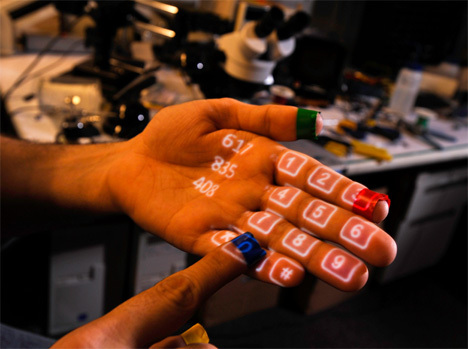 That’s what Pattie Maes and Pranav Mistry of MIT’s Media Lab propose. They want to equip humans with a roving, interactive internet-equipped interface that gives instant, nearly unlimited information about our surroundings while letting us manipulate information like never before. 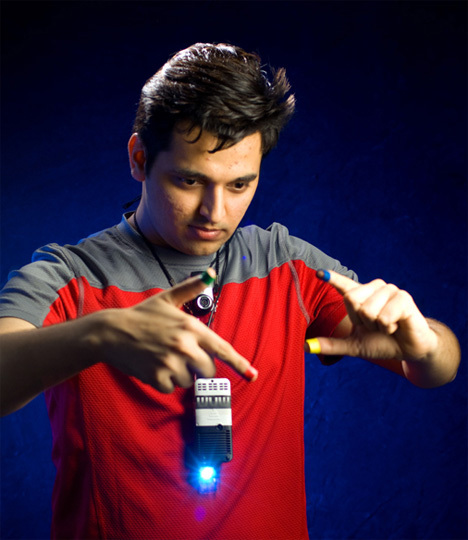 Their invention, called (appropriately) SixthSense, consists of a small wearable camera, a mini-projector, and colored finger markers. 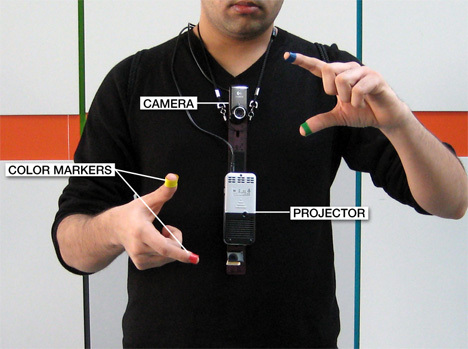 The colored markers act as cues to the camera to let it follow your finger movements. Simple movements are recognized by the system and act as commands. For example, drawing a circle on your wrist tells the system to project a watch face onto your arm. Framing a scene with your fingers will cue the system to snap a picture. Any surface can be the screen for this ultimate computer. Pick up a book and reviews of that title will be projected right onto its cover. Hold up your hand and read which movies are playing, or even use your hand as a phone keypad. 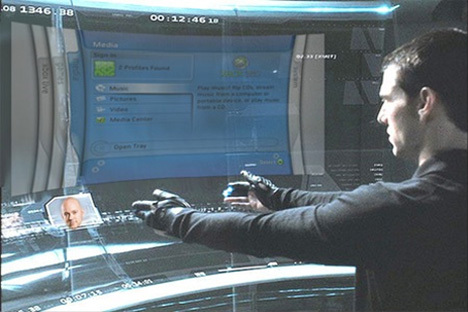 And you won’t even need to wear the goofy gloves Tom Cruise wore to interact with his system in Minority Report. You can wear the colored bands on your fingers, or simply paint your fingernails different colors. The camera picks up information from just about everything in your physical environment. If you go into a store and pick up a product, the system will tell you how well it matches your particular tastes and possibly give you further related information. Holding a plane boarding pass in front of the camera will allow the system to project flight information onto the paper. Newspapers will no longer be a static source of information that’s old before it even gets to you. When wearing SixthSense, the system projects right onto the paper updated bits about the news stories that you’re reading. Reading the paper would become a more dynamic, interactive experience. Although the incredible system is at least several years away from being ready for mass consumption, the team working on the project is confident that it will someday be a reality. The technology already exists, but condensing it into a small, inconspicuous package may be a challenge. According to the above video, the entire system will only cost about the same as a cell phone does today.